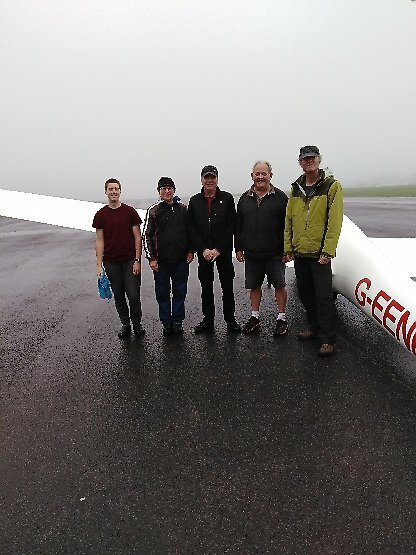 What a great day, despite the fog to start and low cloud which gave us a rest at lunchtime, our first 10 UWE students had a great time and were kept busy by the duty team ably assisted by Jonathan Apperley and our new CFI Elliott Apperley. Other club members also helped out with running the launch point and a few of them flew. Chris Ashworth flew the two one-day courses. Thanks to Fran who is expecting another load of "First flights" tomorrow too, and anyone else I have missed! Barrie Taylor joined us for the day and had a currency flight in the K23. 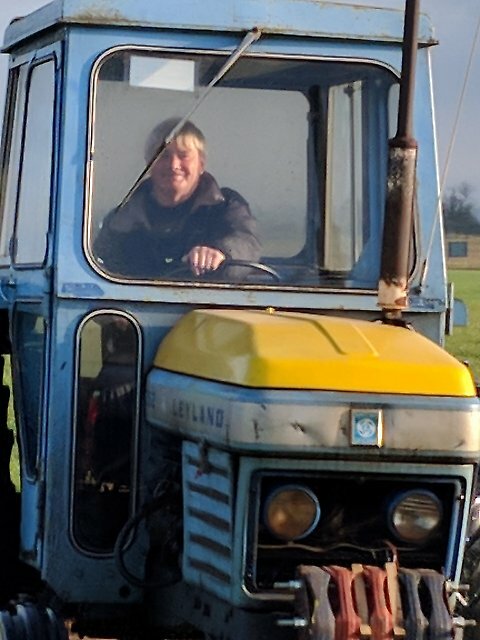 Lesley popped in for a cuppa and chat, the LS3 and ventus ct came out for an airing, and the lawnmower came out to trim the grass. 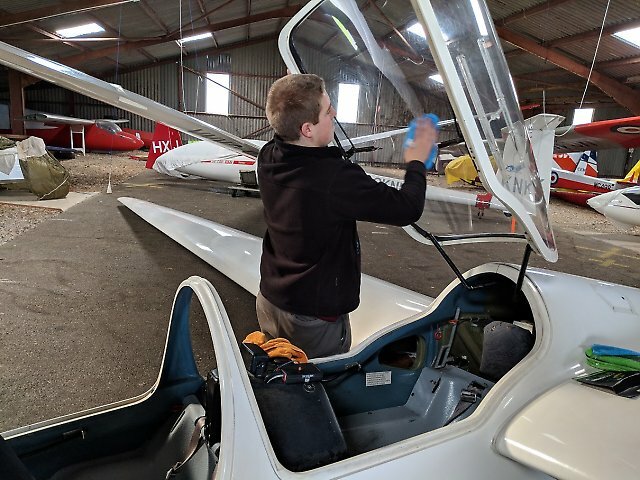 Some fun flying for the course, with loops chandelles and cloud recovery practice. A good area of grass was cut today, now it is getting cooler we hope the grass will stop growing so quickly. The day ended with dinner and some red wine at the old Lodge. After all the Kemble restaurant was not available. 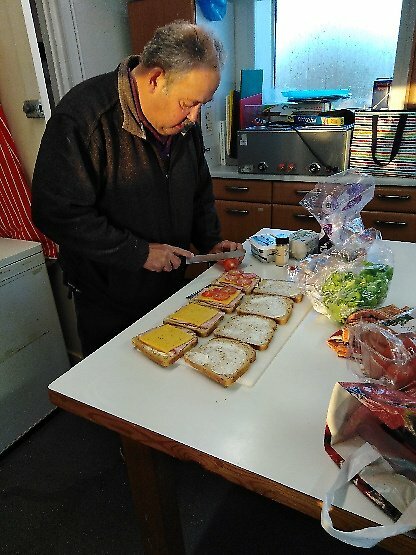 The pictures show david on sandwich making duties, the tractor off to the launchpoint, and a flight above the clouds. light northerly winds. cloud bases rising to 3000ft. Very little thermal activity. Good to see the regular club members here and welcome to our visitor Ben from Nympsfield. The first decent day for course member Phil May who managed some excellent flights from start to finish. Lawrence and Collin were perfecting more advanced handling exercises. Roger and Pat looked after the steady stream of club members, a very pleasant and chilled day at the launch point. 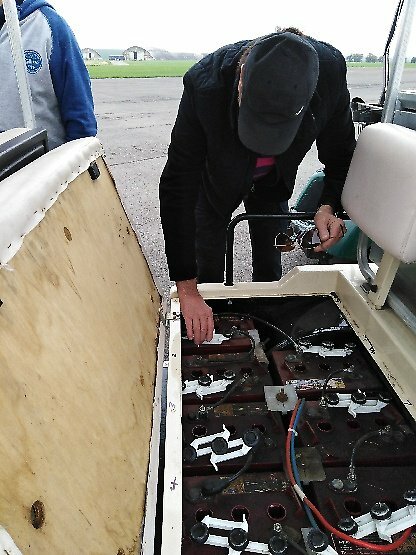 The picture shows Collin checking over the electric buggies batteries, doing the routing check before topping up with distilled water. Dinner was an eclectic mix of contributions including triple chocolate ice cream produced by David Hart---delicious. winds 200/15 with fog to start and low cloud for most of the day. The K21 has now had a polish and looks a lot better for it. Thanks to Collin, Lawrence and Ethan for your efforts here. 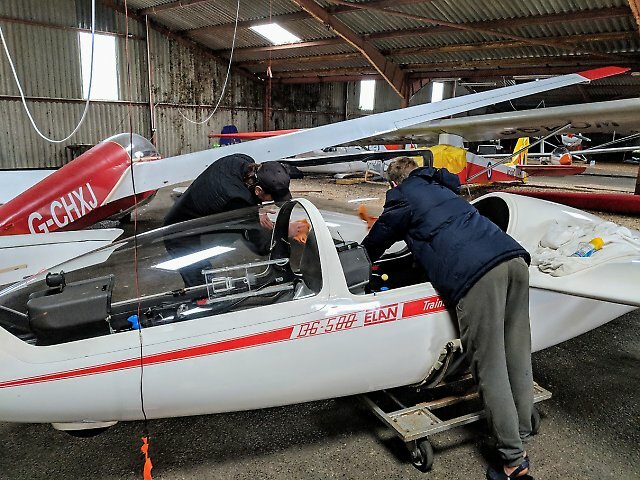 The flying incorporated launch failures and eventually circuits learning how to interpret a turn and slip and how an ASI may be used as a crude attitude indicator. At least we got the annual refreshers completed and had some fun---despite the weather. Low cloud and NE winds today with some drizzle. Welcome to Collin Boden, Lawrence Wood and Phil May on the last course of 2018. Ethan has joined us for a few days to assist at the launchpoint, good to see you. 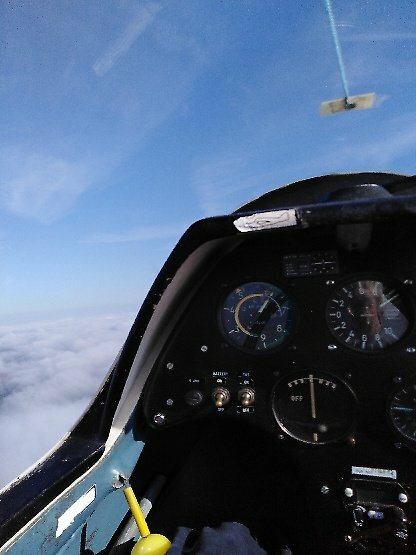 Lecture this morning was on instrument flying, the way to use them and how to get yourself out of trouble if you do inadvertently enter cloud with a limited panel. 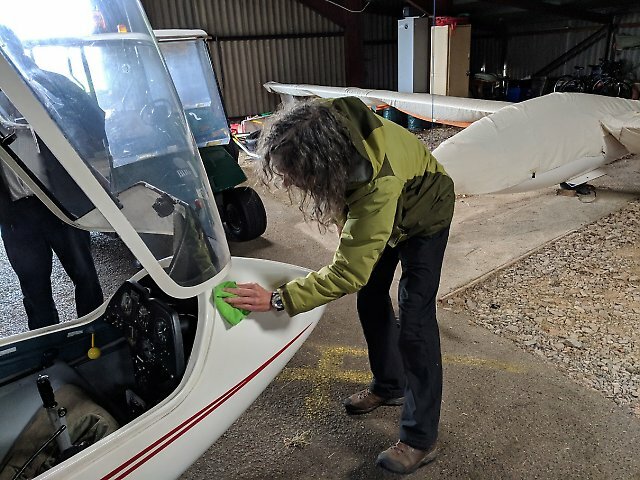 Thanks everyone for the time spent housekeeping the gliders. 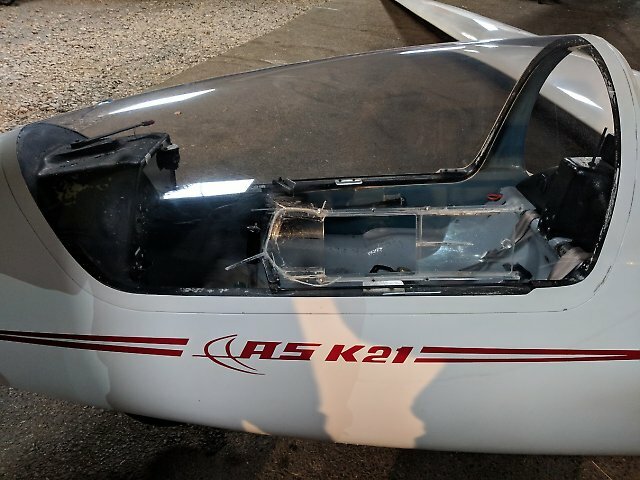 The untidy patchwork of electrical tape on the K21 canopy has now been removed and the club gliders have freshly polished canopies---much better. The lecture in the afternoon was on ridge soaring and the Cotswold edge. Morning, looking out the window and at the various met websites we can expect the current rain to persist until at least 1500 when it will go to showers. Flying, Saturday 13th October 2018. 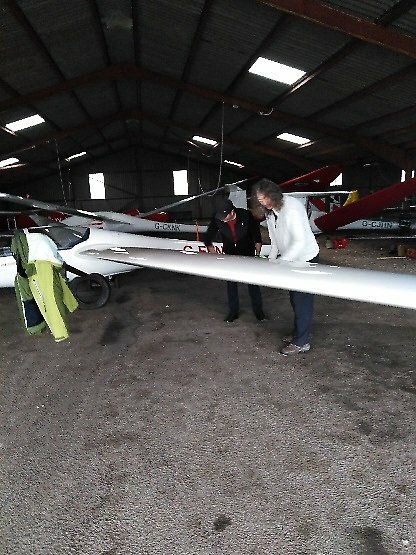 In case you're in any doubt, and after several hours sitting in the wind-swept Clubhouse, Robin and I have given up any hope of flying today. The wind-gauge was regularly showing 30+ knots, and the gust forecast was for gusts of 40-50mph. Actually, we cancelled the two one-day courses yesterday based on the forecast. Maybe conditions will have moderated by tomorrow afternoon. Forecast winds 190/50 with rain. Not a good day to go flying. 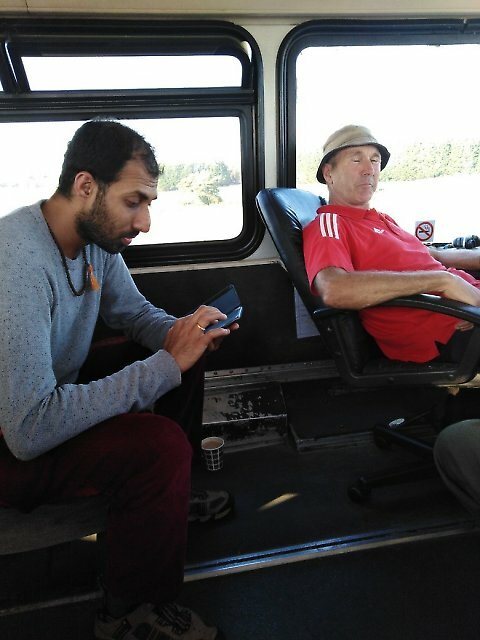 11 October, the winds finally stopped us. Flying started with the launchpoint a long way down the runway to ensure cables drop clear of buildings etc. A very awkward direction. Initially the winds were quite light and not a problem for flying. As the morning progressed, the winds reached a limit and we were forced to stop. meanwhile Nigel Payne flew the ASW19 for the first time and Matthew Veals converted to the K23. After lunch briefings were on instrument flying followed by a talk on Mcready. Course dinner was at the Old Lodge, Fish and chips seemed to be the favourite choice, and a beer of course. The outlook for Friday is grim, with strong winds and rain, oh well the first 4 days were good. Operations were from 09 today, a very busy course day with very productive training and plenty of practice landing on the runway. A total of 28 launches including 2 self launchers. A few club members turned up but the wind direction was a little off putting. Many thanks to our helpers Andy Davey and David Hart. Andy Davey and Pat at launch point control.